Dry Rub Recipes Herbed Salt Mix Dry Brine call it what you will, it keeps meat juicy & tender on the grill, adding lots of spicy flavor w/o extra calories. A Dry Brine is a meat or vegetable dry rub with salt added. It usually contains sugar or another sweetener that caramelizes during grilling to form a crust on the outside of the meat. Grill masters call this the “bark”. 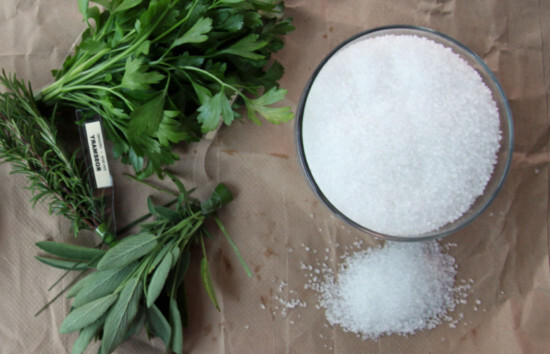 A Dry Rub is a salt-free and sugar-free mix of dried herbs and spices. 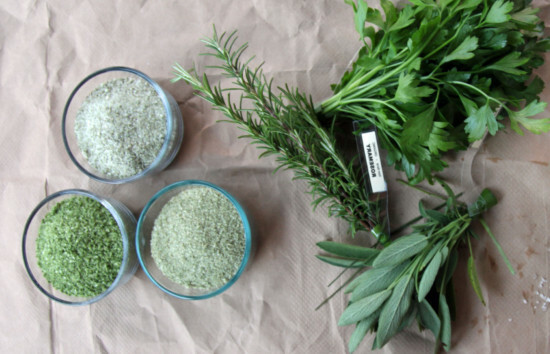 DIRECTIONS – use a variety of fresh herbs to create herbed salt as a base for your meat and vegetable rubs. 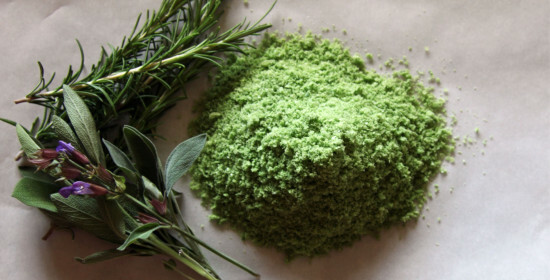 In a food processor or blender, mix one bunch of washed and dried, fresh herbs and salt until herbs are ground down into coarse salt. If herbs have woody stem, remove leaves and discard stems before using. Dry on cookie sheet lined with parchment paper. To speed drying place in oven set to warm. Keep temperature below 108ºF to preserve benefits of fresh herbs. Store leftover salt rub or dry brine in glass mason jar with lid or other airtight container. PLEASE NOTE— you can also use Chipotle Pepper with Chili Powder or Cayenne Pepper. *NOTE: want it Spicy Hot? Add 1t to 1T Chipotle Pepper to mix. You can also use Chili Pepper or Cayenne Pepper. DIRECTIONS—mix ingredients. Rub on chicken meat [if your chicken has skin, you will have to remove the skin or rub under the skin]. Rub on enough dry brine just to color the meat, don’t go too thick. Place chicken in single layer in shallow baking dish or plate. Cover and refrigerate 30-60 minutes before grilling or cooking. *NOTE: want it Spicy Hot? Add 1t up to 1T Chipotle Pepper to mix. You can also use chili pepper or cayenne pepper. DIRECTIONS—mix all ingredients. Rub on beef, using just enough brine to coat meat, don’t go too thick. Place beef in single layer in shallow baking dish or plate, cover, and refrigerate 30-60 min. before grilling/cooking. DIRECTIONS: mix all ingredients. Rub on veggie planks or rounds. Use just enough rub to coat, don’t go too thick. Arrange in single layer on parchment covered cookie sheet, cover, and refrigerate 30-60 minutes before grilling/cooking. DIRECTIONS: mix all ingredients. Rub on veggie planks or rounds. Use just enough rub to coat, don’t go too thick. Arrange in single layer on parchment covered cookie sheet and let stand 30-60 minutes before grilling or cooking. Metatags: Dry Rub Recipes Herbed Salt Mix Dry Brine call it what you will, it keeps meat juicy & tender on the grill, adding lots of spicy flavor w/o extra calories.